Hypocenter depth recalculated from 10.0 to 15.0 km. 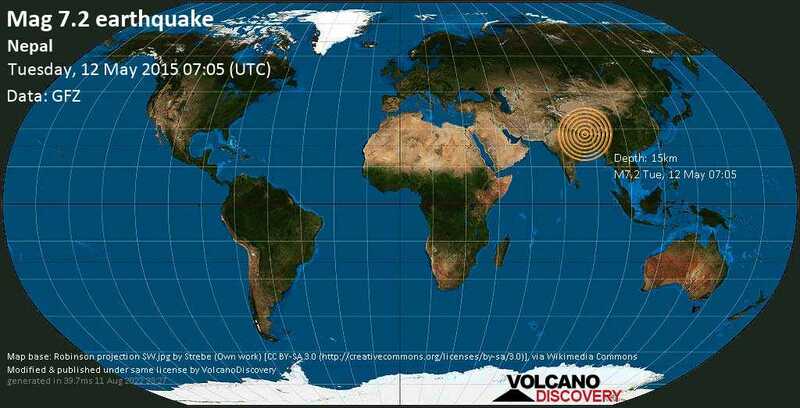 Darjeeling, West Bengal, India (621.6 km SSE from epicenter) [Map] / MMI V (Moderate shaking): The table inside started moving, earth was swinging, like being on a boat, everyone ran outside the house, tremor continued. Felt many tremors in the following hour and found out later that there were 4 shakes. Kathmandu / MMI VI (Strong shaking): about one minute of shaking experienced in the 4th floor. Impossible to walk without danger of falling falling (drunkard style). Low but visible damage to structures. Bagnan, 50 Km South West of Kolkata (621.1 km SSE from epicenter) [Map] / MMI IV (Light shaking): I was in our Works. Molten Zinc in The galvanizing Vat started Oscillating quite noticeably. Chairs were rocking mildly and hanging fixtures were oscillating. There were a couplreof subsequent tremors also. kathmandu, Nepal (82.4 km W from epicenter) [Map] / MMI VII (Very strong shaking): Very scary earthquake in Kathmandu since April 25. Continuous aftershocks. Again today earthquake 7.3 Magnitude. Many homes in Kathmandu collapsed. Today 39 people dies and 1000 people injured forecast by news. Siliguri / MMI VIII (Severe shaking): I was on the 3rd floor in my home with my family, there was violent shaking and it became very difficult to go do down the stairs . Cracks appeared in exterior walls of our house. Everybody ran out of their homes to the streets. salt lake, kolkata / MMI VI (Strong shaking): I fet lt it. I was in college, 4th floor. I felt it for around 8-10 seconds. Kolkata (624 km SSE from epicenter) [Map] / MMI IV (Light shaking): The tremors were felt twice at the interval of around 20 minutes. It felt as if shaking someone. Paintings on the wall started shaking. All the people from offices ran down. New Delhi (878.9 km W from epicenter) [Map] / MMI IV (Light shaking): I could feel this one a little stronger than the one occurred about two weeks before, the one that was reported as the strongest in Nepal. :( Pray for Nepal. KOLKATA, INDIA / MMI VI (Strong shaking): I WAS IN A POWER PLANT NEAR KOLKATA AND ALL THE STRUCTURE IS MOVING. mirpur, dhaka, bangladesh / MMI IV (Light shaking): As I m living in a 8 stored building, the building was shaking & all the people were anxious to give away from. begusarai / MMI IV (Light shaking): it was very horrible.i had much fear that time. Chandigarh (966 km WNW from epicenter) [Map] / MMI V (Moderate shaking): Experienced in office and all our office. All colleague exit to open. Lucknow (522.4 km W from epicenter) [Map] / MMI VI (Strong shaking): shaking was felt for more than a minute, with ceiling fans continuing to swing even after that. delhi / MMI IV (Light shaking): I was doing some work on PC when I felt it. Varanasi, India (416.4 km SW from epicenter) [Map] / MMI V (Moderate shaking): In Varanasi it felt more strong than during the last big earthquake in Nepal in April. KOlkata (621.4 km SSE from epicenter) [Map] / MMI V (Moderate shaking): sitting in office when my head started to spin and I asked my friend if it was an earthquake. On comfirmation we closed the office and walked down. Kolkata (621.6 km SSE from epicenter) [Map] / MMI VI (Strong shaking): the ground shook for around 30 seconds, and then after fifteen minutes, shook for another 14-15 seconds. No massive damage, but cars in the streets stopped. Nishant Mohan, Noida (859.9 km W from epicenter) [Map] / MMI V (Moderate shaking): My chair started shaking... even though I was sitting on it. Gurgaon (889.5 km W from epicenter) [Map] / MMI V (Moderate shaking): Was having a call with colleagues in Delhi. And we had to excuse ourselves from the meeting saying 'Sorry, we're having an earthquake here'!! Everyone had to evacuate the building and run outside. Kolkata (626.5 km SSE from epicenter) [Map] / MMI III (Weak shaking): Ceiling fan swining.. felt like my head was spinning. Kolkata / MMI VI (Strong shaking): Quite a powerful and strong shake again! Gurgaon (888.7 km W from epicenter) [Map] / MMI IV (Light shaking): Office building swayed, it's always scary and makes you dizzy. Kolkata / MMI IX (Violent shaking): Ground shook for about a minute, felt after shock too. Metro emptied in Kolkata. Varanasi (413.4 km SW from epicenter) [Map] / MMI VI (Strong shaking): Was in office building in basement when i felt it. Felt 2 Big shakes then alarmed everyone and went out. Glass windows were still shaking when we went out. Kolkata (626.5 km SSE from epicenter) [Map] / MMI III (Weak shaking): It felt like head spinning... I looked up to see the ceiling fan swinging on its own... everyone at office walked out onto the street. Kanpur India / MMI V (Moderate shaking): Scared!!! GHAZIABAD, NCR, INDIA. (861.5 km W from epicenter) [Map] / MMI V (Moderate shaking): I feel it stronger than the previous earthquake of 26th April 2015.
deoria / MMI IX (Violent shaking): I was terrified as hell and ran asap out of my house.